Warm days. Family picnics. Juicy watermelon. Sand castles and body surfing. Lightening bugs and county fairs. Summer! I always have such high expectations for this short season. Can’t wait for summer! Where did the ideal I dream of come from? Beach blanket movies? The Beach Boys music? (Okay – so now you know my age.) A happy childhood perhaps? Building forts in the woods, digging quahogs in the salt pond, swinging in Gramma’s hammock are some of my summer memories. My responsibilities consisted of age appropriate chores and no other worry in the world. Looking back from an adult perspective, I see what my kid-self missed. Daddy working full-time in the hot mill, plus an additional two or three other jobs to feed his growing brood. Mommy recording every penny she spent in a small account book. The worry over aging parents and sick kids. The loss of loved ones. Some of the same concerns and tragedies that have intruded on my adult summers and left me longing for the innocence of childhood. This spring has been filled with news of floods, tornadoes, forest fires and earthquakes. National tragedy and personal loss have already made a mark on my summer – and it’s only just arrived! My heart goes out to all those who have lost homes, jobs and loved ones. Summer will not be idyllic for so many as they struggle to rebuild lives ravaged by accidents, wind and water. In Out of the Wilderness, there’s the fun of a bonfire on the beach, swims in the ocean, a ride on the carousel, but the threat of tragedy weaves through the happy times. Just as in real life. Real life. A patchwork of happy days and sad times. Days filled with highs and lows of every measure. The distance between my expectations for summer and the reality grows wider with each passing year. 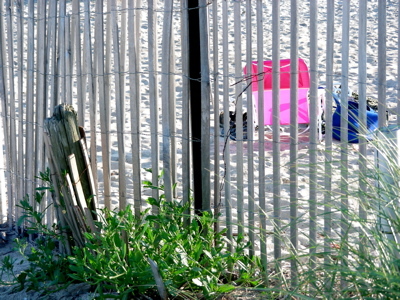 There is no returning to the blissful summer days of my early years. God’s plan for me was not to stay forever young. He knew since my conception what every summer of my life would hold. Some would have more rainy days than sunshine. This year may unfold with winds as gentle as butterfly wings or as destructive as a hurricane. God never promised only good times, but He did promise to always be with me and help me through the difficult times. And therein lies the joy I can claim. Being present in each circumstance while drawing on God’s mercy and grace. I can’t return to what summer ‘used to be’, but I can move forward confident in God’s grace. Drawing my strength from Him, I can handle what comes my way and know that because He is merciful, He will give me new happy memories along the way. What are your happy memories of summer? Posted in Anita K Greene, Author, Creativity, Inspirational, Writer and tagged Beach, God, Isaiah 41:10, Out of The Wilderness, Psalm 46:1, Summer. Bookmark the permalink. The last four cards I created were sympathy cards, so it was a nice change to make a card for a happy occasion. 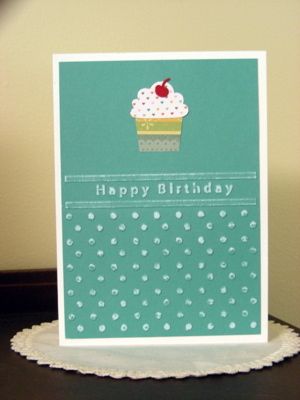 I used the Stampin’ Up Cupcake punch and the Happy Birthday embossing folder from Crafts Too. (Darice has a very similar Happy Birthday folder). The paper is Core’dinations paper. After embossing the paper, I sanded it to expose the white core. I like the roughed up, fuzzy look. Considered adding sparkles, but decided I liked the simplicity instead. Now I’m off to bake a birthday cake and then prepare a nice grilled steak dinner. Posted in Anita K Greene, Author, Creativity, Paper craft, Writer and tagged Cardmaking, Core'dinations, create, Cupcake Punch, Darice, embossing folder, Happy Birthday, Stampin' Up. Bookmark the permalink. 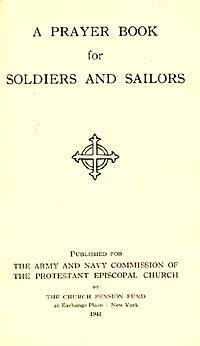 This small prayer book was produced in 1941 by the Army and Navy Commission of the Protestant Episcopal Church for the use of soldiers and sailors in the Armed Forces during WWII. It includes ‘An Order for Worship’ as well as Prayers, Psalms, Reading From the Bible and Hymns. On this Memorial Day, the following prayer taken from this book and titled FOR ALL IN THE SERVICE OF OUR COUNTRY is my prayer for the brave men and women serving in our nation’s armed forces. My thanks to all who are serving now or have served in the past. May God bless you tenfold. Posted in Anita K Greene, Author, Inspirational, Writer and tagged Armed Forces, Memorial Day, Prayer Book, World War II, WWII. Bookmark the permalink. YOU are a marvelous wonder! 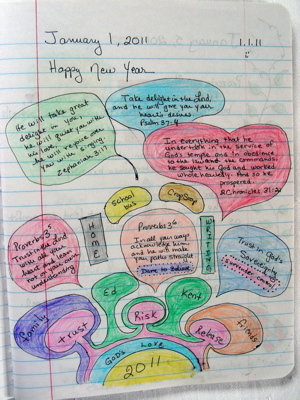 I read Sybil MacBeth’s book, Praying in Color – Drawing a New Path to God at the end of 2010. Because my quiet time is very early in the morning, I found myself drifting into an early morning nap instead of praying. I needed a change to make my prayer time fresh and vital. Sybil’s book appealed to my creative nature. A black and white composition notebook is my prayer journal. I use a black gel pen and colored pencils. I like their soft colors and I already had them in the house (by the gazillion). 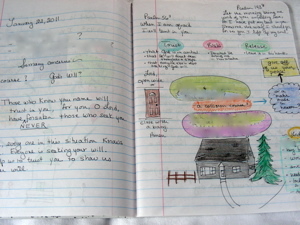 I also use the opposite page to record bible verses, thoughts and revelations that come during prayer time. You don’t need artistic talent to enjoy this prayer form. The idea is to be fully engaged in praying. I consider my finished product not only a visual record of my prayer, but an offering to God. Once again, I’m a small child giving my loving parent a picture, sharing with Him my thoughts as I scribble and color. Has your prayer time ever felt stale? What have you done to change that? I’d love to hear from you. Posted in Anita K Greene, Author, Creativity, Inspirational, Writer and tagged composition notebook, Drawing a New Path to God, Prayer, Prayer Journal, Praying in Color, Sybil MacBeth. Bookmark the permalink. 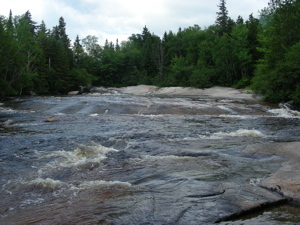 The Ledge Falls area in Baxter State Park inspired a scene in my current WIP, Out of the Wilderness. The constant rushing of the river has smoothed the surface of the ledge. In my story, an attempt to cross the river as a heavy rainstorm rolls in leads to disaster. A force too powerful to be subdued, the many and varied aspects of nature can be used to create intense conflict within a story. Raging rivers, hurricanes, wild animals and forest fires are only a few of the choices available to a writer. Overcoming the difficulties created by the external conflict of Nature gone wild often changes a character internally. And that is the goal of the writer. To show change, for better or for worse, in a character. What experience, good or bad, have you had with Nature? Posted in Anita K Greene, Author, Writer and tagged Baxter State Park, Ledge Falls, Out of The Wilderness. Bookmark the permalink. Here is my favorite card created at May Stamp Camp. It takes a little figuring to be sure when the card is opened, everything is right side up. You want the little squiggle border (hand drawn) on the second circle to frame the smaller top circle. That little heart was stamped to cover a finger print left there by yours truly… my creative solution. I love this little card. It fits best in a square envelope. Pull the satin ribbon tab to open the card! Open to reveal the stamped image on the second circle and words on the third circle. 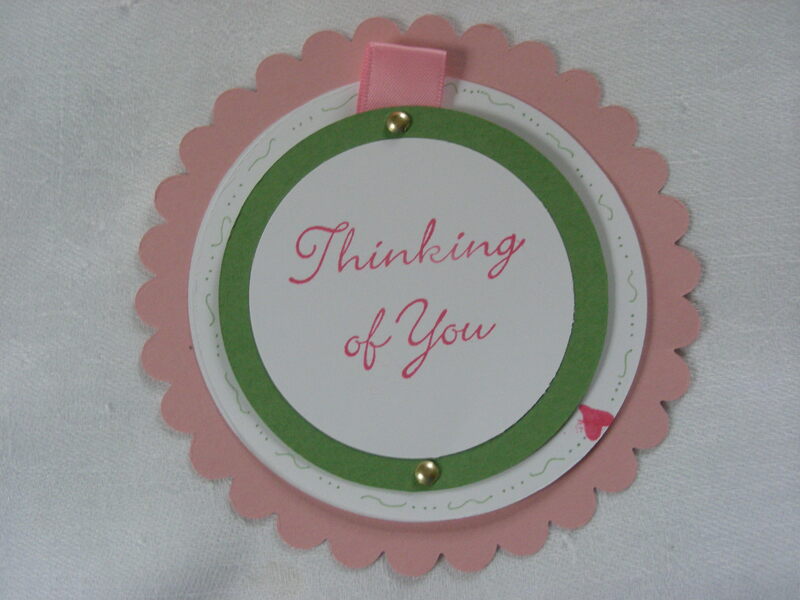 Posted in Anita K Greene, Author, Creativity, Paper craft, Writer and tagged Circle Card, Thinking of You. Bookmark the permalink.